Anyone need a raw rock machine? This is it. Not everyone will like the design quirks. …and some extreme body contouring. Classed by designer Trevor Wilkinson as a "no-brainer", the Eclat DBC is obviously based on the Les Paul Junior. 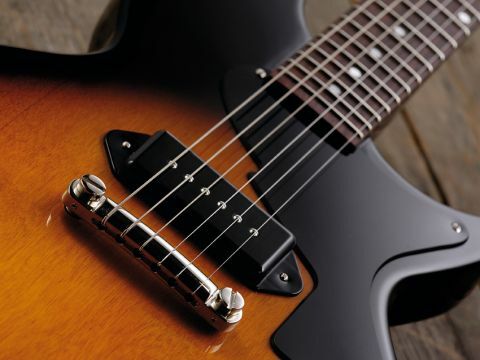 The standard Eclat resides in Fret-King's Blue Label range - a Wilkinson-ised version of a Les Paul Standard while the Eclat 2 goes for more of a Les Paul Special vibe. "The Eclat DBC isn't a guitar to obsess over, just one to plug in…"
Aside from the iconic outline, this Eclat DBC differs with that very un-Gibson-like shoulder and cutaway, and like the other Eclats we have a scooped forearm cut here. Aside from that it follows the Junior recipe: 45mm thick slab body with small edge radius, mahogany set neck with dot-inlaid 22-fret rosewood 'board. a single-ply scratchplate and rear-mounted volume and tone controls, the output jack held in a recessed Tele-type collar. Warming our test amps up with an original Les Paul Junior, we're reminded just how raw and brutal they can sound. With a 'c'mon beat that' cockiness we plug in the Fret-King and are very pleasantly surprised. The hot output of the '57 Junior is matched here; there's less hi-fidelity, the Eclat sounds a little rounder but with similar juicy mid-range and roomy low-end. Dial in a classic crunch amp tone and you have the archetypal rock rhythm machine. Kick in a level boost and the combination of the hot output and single-coil sparkle is the perfect anecdote to the almost over compressed LP Standard lead tone - this is edgier. The tone control is nicely graduated: fully off, that choked 'woman' tone is more than usable while the volume control does soften things slightly when reduced. On our original LP Junior it almost enhances the sparkle as the amp cleans up. The Eclat is different, but is a 'Junior' this writer would happily take on a gig, as its tuning is more stable, the neck less of a log and upper fret access easier. You can buy a US-made Gibson Les Paul Junior for the same price as this DBC model, which clearly remains its huge rival. Is the DBC 'better'? Quite probably, but the iconic appearance and name is a huge draw. Do yourself a favour and try the DBC though - it's a really good rock guitar.